Oh.My.God. In his prologue to this recipe in The Perfect Scoop , David Lebovitz says that when he first made this ice cream it was so good he licked the dasher clean when it was done churning. I may have done him one better. After licking the dasher clean, I took a spoon to clean up all the bits of ice cream that were still frozen to the sides of the bowl and hadn’t made it into the freezer container. This is, without question, the absolute best chocolate ice cream I have ever eaten. And I certainly have eaten enough to guarantee that the previous statement is statistically accurate. 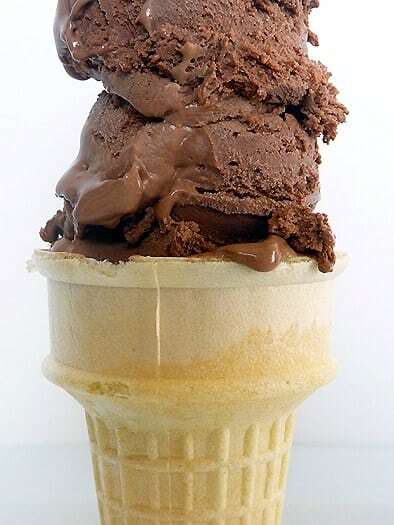 Smooth, creamy, and the most intense chocolate flavor you will ever find in a chocolate ice cream. Let’s talk about the chocolate, shall we? This recipe calls for Dutch-process cocoa powder*, which adds a tremendous amount of depth and richness to this ice cream. I believe it’s a drastically improved flavor over what you would get using a regular unsweetened cocoa powder. The recipe then gives the option of semisweet or bittersweet chocolate and I used 60% bittersweet. I love dark chocolate and it definitely added an extra oomph of richness to the ice cream. I really just can’t say enough about the incredible flavor of this ice cream and I think the Dutch-process cocoa and the bittersweet chocolate is a stellar combination. And now, on to the texture. This is the first time I have made ice cream using egg yolks to thicken the custard and I’ve been officially converted. While the other ice creams I’ve made have had a nice texture, this ice cream is completely unmatched. It is unbelievably smooth and creamy, and you can run a spoon through it straight from the freezer like you’re cutting butter. Absolutely superb. And now I need your help. I am in need of a quality ice cream scoop. I want the pretty round scoops. Does anyone have any recommendations? I recently saw the Rösle ice cream scoop received high praise from Cook’s Illustrated, but am interested in hearing about any that you use and love. Thanks for the input! *I typically can’t find Dutch-process cocoa powder in the regular grocery stores in my area; if you’re in the same boat, you can easily order it online. I have ordered it both from Penzeys and Amazon with no problem. I would highly recommend getting it, as you can use it in many other chocolate baked goods as well. Penzeys offers smaller quantities, so if you just want to try it out, you can get a small bag of it through them for a much lower cost. Want more ice cream? 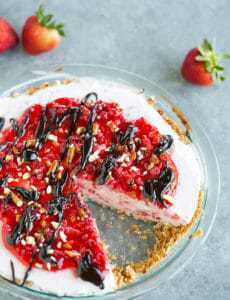 Check out the Blueberry Cheesecake and Classic Vanilla recipes. Don’t forget! If you’re dying to make homemade ice cream and cursing yourself for not having an ice cream maker, head straight to this tutorial on how to make homemade ice cream without an ice cream maker! Thanks for this excellent recipe, we all enjoyed this Chocolate Ice-Cream. Ahh.. Love this anytime.. 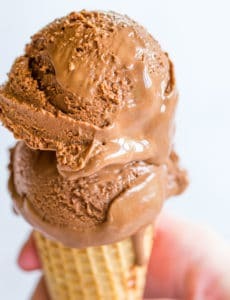 Such a Nice Recipe of chocolate Ice-Cream.. I will Try soon. Oh. My. Gosh! Best ice cream ever … and I did not normally go for chocolate ice cream. Not only was it simple to make, but it was incredibly delicious and SO creamy! Can’t ever go back to store-bought ice cream, that’s for sure! 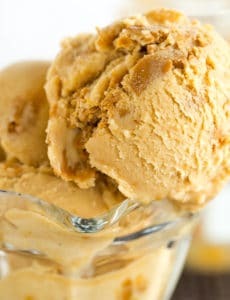 Thanks for sharing David’s recipe … I’ve got my mom in law to pick up a copy of The Perfect Scoop for me. Loved this ice cream recipe…..however, once chilled over night it was so thick it broke my ice cream attachment :( I whisked it to thin it out as you suggested but it just wouldn’t churn. The kitchen looked like chocolate chainsaw massacre! 😂 It did taste amazing so I don’t want to give up on it! . I have a kitchenaid ice cream attachment. (Maybe I should invest in something a bit more professional). Would you suggest churning it once its made and then cooled over an ice bath instead? Oh no!!! I’ve made it a bunch of time and while thick it’s always churned. I also have the Kitchen Aid ice cream attachment. It theoretically should chill longer than just the ice bath, but since it got so thick for you, give it a try that way! Fab chocolate ice cream base recipe, made with Single Estate 71% chocolate and dash of fine coffee. Along with homemade ice cream cones, bowls and wafers… Fun for all at dearest hubby’s Bucket list, Ice cream sundae party. Terminal and fighting 4 different cancers. Claire, I’m so so very sorry to hear about your husband :( My best to you and your family… I’m happy to hear the ice cream was enjoyed! In case you’re still looking for a great ice cream scooper, Cutco I believe has the best! It kind of like melts the ice cream no matter how frozen it is. Yet, gives you the picture perfect scoop with ease. This is absolutely wonderful. Its easy to make and delicious to eat. Love that creamy and chocolaty taste that goes perfectly together. This recipe will be with me till I die. Thank you very much for sharing this magic. I’m an experienced ice cream maker, but I’m not partial to chocolate ice cream. My husband asked for chocolate though, so I scoured the Internet looking for a good one. In addition, I’m hosting an ice cream party soon, and chocolate is pretty much mandatory in the selection. I made this recipe exactly as written, and all I can say is WOW! It has to be the richest, most chocolatey ice cream I’ve ever tasted, and my husband is in heaven! This is definitely going to be one of the six ice creams I’ll be serving at the ice cream party, and I’m only making the best. Thank you so much for this superb recipe! Best chocolate ice cream I’ve made yet! Thanks for the recipe! Hey, thought I would make this to christen my ice cream maker! Can I make the mix and leave it overnight to cool before sticking it in the ice cream maker in the morning? Wowza! Another successful recipe. Just finished churning; the quart is in the freezer. Like you, I kicked EVERYTHING clean. That chocolate flavor is so deep. Yum!!! Thanks, Michelle! By the way, I know you’re in love with your current recipe for vanilla ice cream, but have you tried Cook’s Illustrated’s? It’s even better! This was the first time I made chocolate ice cream and deliberately chose this recipe for the quantity of egg yolks and the two types of chocolate, but Cook’s vanilla is ultra dense and smooth. It’s worth trying! Hi Lisa, Isn’t this ice cream amazing?! I haven’t tried the Cook’s Illustrated vanilla, I’ll give it a go this summer! Great recipe. I live in Belize and own a maya stone ground chocolate company . We have started to make ice cream using your recipe and freezing it with nitrogen since we are off grid. It has been a big hit. People say itbismthe best ice cream they have ever had. I attribute part of that to using our pure stink ground cacao that still has the cocoa butter in it. EXCELLENT!!! Used Hershey cocoa powder and Ghiradelli mini semi sweet chips, ..best chocolate ice cream I have ever made!!! YUM! Thank you so much! This ice cream is SO good. Really chocolatey and rich. A small serving is all you need. Thank you for the great recipe! What a perfect texture… ! You’ll be glad to know that my dear ice cream snobbish husband has declared that I need not look any further…this recipe is THE one. There ya have it. I just got the wonderful Kitchenaid ice cream attachment for Christmas and really, really want to try this. (Can I just say YUM?) But I’m confused as to how this is done using the attachment. It only says to freeze in your ice cream maker, but all the Kitchenaid recipes only call for mixing in the attachment and then freezing in a separate container. Can you clarify? At what point in this recipe did you use your attachment? Hi Lauren, I apologize if the language in confusing. Sometimes in ice cream recipes, the terms “freeze” and “churn” are used interchangeably. Where it says “freeze in your ice cream maker”, this is where you would use your attachment and churn the ice cream. Then, transfer to a container to store in the freezer. Hi! I live in Melbourne Australia, and I just made your recipe with my Kitchenaid icecream attachment – can I just say it tasted absolutely AMA ZING! I can’t wait for it to finish freezing in my fridge tonight! Thanks so much for posting the recipe – loved making it and will so enjoy the eating! Thanks again for your very easy to follow instructions. Best wishes to you for Christmas and the New Year. I am no chocolate lover but my husband prefers it over any other flavor. I just got a KA mixer with the ice cream attachment and first made two versions of vanilla. Neither turned out perfectly. I knew I had to make chocolate next for hubby and I found your recipe. I just put it in the freezer to set and what i ate off the dasher was divine. Hubby’s going to love it. I used heavy whipping cream in place of the cream. Would that explain why my ice cream was nearly overflowing my bowl while it was churning? I also used Nestle semi sweet mini chips as that’s the Thanks a million for the recipe and instructions. I used Nestle semisweet mini chips as that’s all my local store carried. I made this ice cream over the weekend as part of a homemade ice cream cake for my wife’s birthday. It is divine.